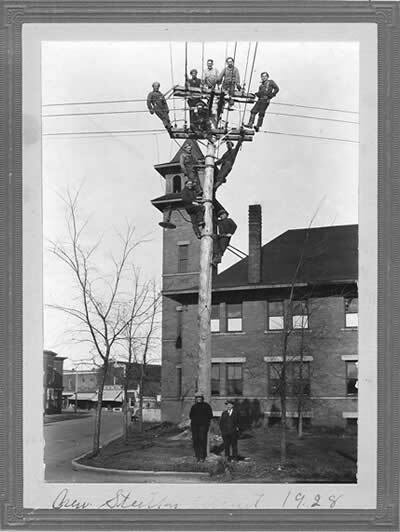 The first electric lighting in Sault Ste. Marie was provided by a small steam plant operated by the Sault Ste. Marie Water, Gas and Light Company which had been incorporated in the summer of 1888. Recognizing the potential of the rapids to generate enough power for an industrial complex at Sault Ste. Marie, Francis H. Clergue bought the company. Clergue’s Tagona Water and Light Company was incorporated on October 9, 1894 and agreed to supply the town with 50 arc lights and 150 incandescent lights for street lighting by July 1, 1895. On November 22, 1913 the Tagona Water and Light Company withdrew its application for the renewal of the light franchise and once again the water and light services for Sault Ste. Marie were owned by its citizens. A bylaw was put to the people during the municipal election on January 1, 1917 and the new Commission started work immediately with its first meeting being held on January 27, 1917. From 1917 to 1920, peak electrical demand more than doubled from 800 kilowatts to 1,800 kilowatts. In June 1930, the Public Utilities Commission cut rates to 1 ½ cents per kWh to give Sault Ste. Marie not only the lowest rates in Ontario but the lowest rates in the country! The domestic rate for all kilowatt hours over 300 was further reduced to ¾ cent per kWh in 1931. The summer of 1955 saw a “Power Emergency” declared in Sault Ste. Marie and a Power Conservation Committee, representing residents, merchants and industry was formed to deal with the problem. To conserve power, a plan to extend Daylight Saving was suggested; night lighting and display lighting were reduced and housewives were asked to lighten their washday load and restrict their use of electric dryers. To save additional power, the Commission removed every second light bulb from its street lighting system. The problem with power shortages that the city had experienced in the fifties came to an end when Great Lakes Power built a connecting line to Ontario Hydro’s Raynor Station near Thessalon in 1959. Instead of conservation, a campaign was started to encourage homeowners to use more power. “Operation Sunshine” which was initiated in 1961, was the latest action in the gas/electricity battle for customers. As part of a sales promotion, a customer would receive a free electric blanket with the purchase of an electric clothes dryer. A reduction in heating rates was proposed and a program for the sale and rental of electric hot water heaters was introduced. The push to “live better electrically” was carried in Commission ads to increase the use of electricity. In the 1970’s the Commission took an innovative step to construct its first transformer station to receive power at 115kV from Great Lakes Power and then step it down to 34.5kV to supply the system’s substations. The promotions of the sixties to boost energy consumption changed into energy conservation during the energy crisis of the seventies. A program of gradually replacing the city’s old mercury vapour streetlights with energy saving high pressure sodium lamps was undertaken by the Public Utilities Commission in the downtown area and at the entrances to the city. In 2000, deregulation of the provincial electrical industry was introduced, the Public Utilities Commission was replaced by a Board of Directors and five new companies were formed; ready to satisfy the requirements of the Energy Competition Act and the Ontario Energy Board’s Regulations and Codes. Today PUC Distribution Inc. serves 29,189 residential and 3,830 general service customers.